CHRIS ALGIERI: Thanks Bernie and it is great to be here. Training is going great so far. Daniel is a wonderful guy to work with and someone I have known for a long time in a personal capacity but to work with him professionally has been a joy. He is willing and trusting with the guidance that I provide and offer. It’s been great so far and he is really a talented guy and he’s going to shock the world on March 18. How did this arrangement come about? CHRIS ALGIERI: I’ve known Danny for a great number of years from being in the boxing circuit in New York and we fought on several cards together in coming up. My manager Kevin Rooney and Danny’s advisor Keith Connolly are very close and the idea of this came up – this fight is the biggest of Danny’s career, he has been a middleweight his entire career and wanted to be able to perform at his best, at the highest level and be able to make the weight as comfortable as possible. They have used nutritionists in the past but none that had boxing experience like mine of course, so they reached out to see if something like this could be worked out, especially scheduling wise and if I would even be interested. We spoke about it and we went back and forth and the timing was right. I knew Danny had wanted this fight for a long time and it’s a huge opportunity for him and all of New York boxing and it was pretty much a no-brainer at that point to get involved. Have you been asked advice in the past from boxers that led you to get involved in this? CHRIS ALGIERI: Absolutely – a little known fact is that I have actually been doing this for a number of years for a multitude of fighters in differing combat sports and disciplines – guys in MMA, UFC and Bellator, wrestlers and boxers. It’s something I’ve been doing alongside my own boxing career for a number of years, this is just more high profile and one that I thought would be impossible to hide from the public. Not that I was trying to hide it, but I was just trying to help fighters out so they could perform at their best. I just felt that was their job. Are you willing to name names? CHRIS ALGIERI: Yes, so I just worked with Ryan LaFlare, a Long Island guy who had a big win a couple of weeks ago. Andres Bermudez who had a tough loss a couple weeks before that. I have been working with Paulie Malignaggi for a big fight that he has coming up. Then a bunch of more lower level guys who are on their way up – Luis Arias, a super middleweight, who is 16 or 17-0. Also guys who I have been working with informally with people who knew of my career outside of boxing and most fighters will grab me and ask me questions when the opportunity arises and I am always willing to share. What is your impression so far of Danny in training camp? CHRIS ALGIERI: The most impressive part for me, and what is a surprising aspect of watching Danny train, is how he hits extremely hard with both hands. That was definitely an eye opener for me. I knew he was a big puncher just from watching his fights, but seeing him first hand in the gym, he is an incredible puncher with both hands which you don’t see very often. Most guys have one good hand and one good shot but he’s got both. Also, leading up to the camp I did a lot of work and his team has been in place for a number of years so I knew what I was getting into in terms of training style and what the schedule would look like in terms of week to week to get a good idea of what was going on in order to initially accept him and to make a plan for his nutrition and a dietary plan. I think I found that, from his team, that he is working harder than ever. He really has been pushing each and every single session. At this point the last couple of weeks he has been holding back and making sure he has been getting enough rest and recovery so he can go out there and perform as hard as he can each and every session. What about you, have you been working out? CHRIS ALGIERI: I’ve been getting some great work out here. I’ve been asked what it’s like out here and it’s a great environment for training. It’s very easy to discipline yourself and focus. The schedule is set and we go and work. Its been great for me in that aspect and I have been getting in some sparring as well. You know me, I am a lifer, so this is a great life style for me to keep in shape and I am always ready for what is next. But right now we are really just focused on March 18 and after that I will be coming home in great shape and ready to get to work if something comes up. CHRIS ALGIERI: I have actually been working with some of Danny’s sparring partners – Sergey Derevyanchenko, Prenice Brewer and another we call Suicide, so I am getting some good work with some middleweights and welterweights and it’s been a lot of fun so far. CHRIS ALGIERI: No there is nothing set right now. What is your perspective on the fight? CHRIS ALGIERI: Danny is the underdog and probably rightfully so leading into this fight with how “GGG” has been doing. In terms of the other contenders out there, Danny presents the best style. He is a long, rangy big middleweight who has very good boxing skills and power in both hands and is supremely conditioned. If you add all that together with Danny’s boxing skills, Danny has a real chance to upset the apple cart and shock the world. 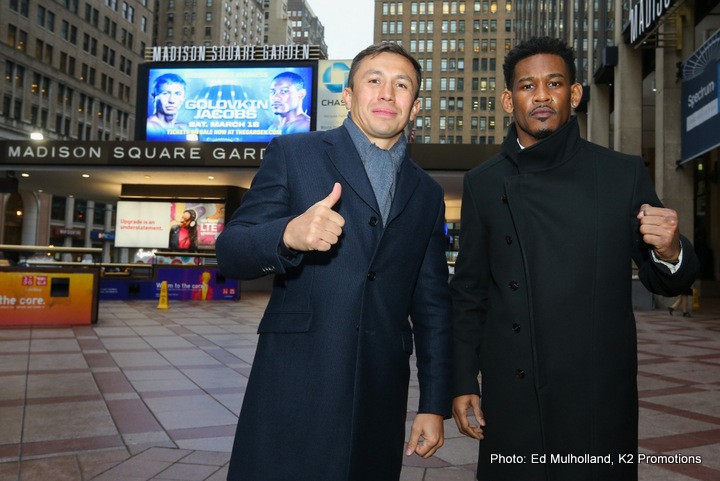 You have been the underdog, against Provodnikov, and won – so how does Jacobs look to you? CHRIS ALGIERI: Being in that position is all psychology and psychology is constant throughout the camp and it builds. Every camp when I was successful as the underdog, we had a mentality in camp to underline psychology and it really builds until fight night. You have to believe in yourself when that bell rings and you have to face the guy across from you who is the favorite. You have no doubt leading into the ring because when you step into the boxing ring you are naked and if you have a doubt it shows. We have really been hammering home the idea that this is our fight to win – this is Danny’s moment, this is Danny’s night and it’s been great to watch him psychologically become more and more confident and he’s been getting in better condition and shedding the weight and been getting better in sparring so I think we are in a great place right now and definitely have momentum on our side and camp has been fun. We are having a good time. There is a lot of hard work and at the same time everyone is on that same path that March 18 is all about victory. What is the day like? Do you spend the whole day with him? CHRIS ALGIERI: I actually spend more time with him than anyone else. I wake him up in the morning and we have breakfast and we train together at that point. Some kind of cardio session then we come back and I cook and we eat and sit around and talk – we talk about the fight and we watch tape as well of Gennady’s past fights and I give my insight of what I think would work and what he thinks and we kind of go back and forth in that sense. Then when it’s boxing we go to the gym and I like to watch what he is doing and when he is sparring I am throwing in pointers here and there. We end the day together when we have dinner then kind of split our ways and I say “OK champ see you in the morning.” It’s been that way throughout. We do have a lot of contact, but as a fighter I know that it is good to have some silent recovery to kind of let the mind slow down so there is often time where you just sit in silence. I’m doing what I’m doing and he’s doing what he’s doing – that mental recovery is extremely important in training camp. How important is it to get away from distractions – like you did when you went to Vegas to train for Pacquiao? CHRIS ALGIERI: It’s a great point and it think it can be kind of understated. It’s easy to get caught up with a lot of distractions and not even so much in a bad way. It could be good distractions, it could be your family, your friends or people reaching out to you to wish you luck or stop by the gym and say hello – those kinds of things although they are not negative, they take some time and take some energy out of you. When you go away to camp you kind of lock yourself away and be 100% totally focused on the task at hand – really focus on all the aspects – not just the aspect of training – the aspect of recovery and mental preparation – the aspect of studying and rehearsing and focusing and visualizing. Those things, there are only so many hours in a day and if you have to spend more of that time dealing with outside influences it takes away from your actual training as a whole. What is the No. 1 mistake that fighters make when they are trying to cut weight? CHRIS ALGIERI: Great question. I just had a presentation about this over in Dallas at a fitness nutrition and sports conference. The pitfalls of what fighters do in training camp to “Make the weight.” What I have seen the most over the years is the most detrimental to one’s health and to actually making the weight is restricting their water intake. I’ve seen it over the years where a fighter would spar cutting their water intake two or three weeks out of their fight in order to hit a number on the scale. I’ll tell you for sure that # 1 that’s not how to make weight and # 2, is detrimental to the athlete’s health and being dehydrated you are not going to perform as sharp, and #3, you are not going to be able to take the punches as well. Our brain needs the spinal fluids, if you are in a dehydrated state in puts you in a much more dangerous position for a brain injury. When you have guys that are stuck on this number on a scale, there is anxiety when it comes to stepping on the scale and it approaches a number that they don’t want to be at, you see guys cutting back on their water intake several weeks out from the fight. Your body does not hold water and you can deplete your water in a few hours or a few days and it does not make any sense to start that far out. When you are cooking, are you counting calories? What is the goal? CHRIS ALGIERI: Depending on the phase of camp, like when I first got here the goal was to fuel Danny properly so that he could perform at a high level since it is more intense out here than what he is use to doing. In order to properly fuel his body so he could get through the workouts, recover from the workouts and be ready for the next day or the next session. And also we had a lot of carbohydrates and protein for recovery and for feeling full. Lots of fresh fruits and vegetables and different kinds of proteins and amino acids – that way we are getting an underlying stock hold of micronutrients and vitamins and minerals – actual nutrition. It’s easy to count and think about macros and calories but the body is much more complicated than that and you have to think about the micronutrient content of your food. You have to believe in the colors in the way that which are indicative of the colors that you see in the foods when we are eating the food and the way that it is prepared is important. I think a lot of the work that we did earlier in the camp when we were loading him up on a nutritional level is starting to show now to really pick up his ability and his output. I was talking to his longtime girlfriend Natalie who was in town and she was saying how Danny wasn’t eating snacks like he normally does – apparently he is a bit of a night snacker – and he hasn’t been complaining about that at all. I said, no it’s because we are packing in so much nutrition in every single meal, he’s not missing anything. There is no need to go reach for snack or chocolates or candies or popcorn or these kinds of things. He’s at a level where his body is satisfied. What do you think about where Danny is now compared to when he began? CHRIS ALGIERI: I think his name says it all – he is a “Miracle Man.” It’s an incredible story – the guy beat cancer. I have been dealing with a lot of guys out here – guys who knew Danny from his amateur days and when he was such a stud. I don’t have that amateur background – I didn’t know him coming up but they all knew each other. I’ve only known Danny coming up through the pro ranks and to hear about how he was then at the beginning of his pro career then his bout with cancer. It’s incredible story and to see where he’s gotten now – he was told he would never fight again and not only did he fight again but he’s a world champion and now obviously in the biggest fight in the division that can be made. It feels good. It’s a heartwarming story. And it’s great when I guy like Danny who has a great personality. Did you go to him or did he come to you? CHRIS ALGIERI: His team reached out to me. He had a nutritionist that he had been using for several camps and they were looking to step it up because of the magnitude of the fight. Were you pleased with Danny’s 30-day weight check? CHRIS ALGIERI: I am actually very pleased with where his weight is at this point. I heard some people talking about how heavy he was but if you noticed the pictures from the weigh-in, we weighed in at his apartment so we didn’t weigh him in at the gym so it wasn’t like he just finished a workout, depleted, which I’m sure that a lot of guys do for the 30-day weigh-in or for the 7-day weigh-in. We had eaten twice before that and he was hydrated. Like I said earlier, athletes dehydrating themselves too early – I have no need nor desire to have my athlete dehydrated for any period of time during training camp. To have him step on a scale to reach a number for fans is not something I really care about. We are actually very happy about where his weight is at this point. He’s a big strong middleweight and his body has been changing properly throughout the last couple weeks and we are able to adjust his hydration and he’ll be ready fight night and I’m looking forward to getting him to a comfortable weight for fight week. Has anything been done drastically from last training camps to get him to this point? CHRIS ALGIERI: I haven’t been involved in his past training camps so I really can’t give an answer on that, although from speaking with the rest of the team he has picked up his intensity and the volume of his workload is important for me to be here to kind of monitor to really increase his nutrition so he is healthy and recovering properly. Do you think the current training camp is something you would use in the future? CHRIS ALGIERI: Yes, it is really a great area to train in. There are a lot of top fighters out here and the facilities are fantastic. I have been getting some really quality sparring out here. Myself I have been able to get my own work in. It’s been high quality work out here and it does make sense – it is a hotbed for training and a place I would like to come to in the future. Have you found yourself tweaking anything he does from a boxing standpoint? Danny, by doing this you are expending too much energy? CHRIS ALGIERI: Absolutely, Danny trusts me and the skill and the level that I have fought at so he will question me often about boxing technique. We have gone over some of his fights and I am present at all of his sparring sessions. Little tweaks here and there and little technical aspects that he gets from guys that have been in there at the highest level always helps. I think there are some aspects of my game that I think Danny could utilize quite well in this fight. With his athleticism and his style. GGG’s style is pretty set and we know how he is going to come. Do you recommend anything that other boxers don’t use? CHRIS ALGIERI: In terms of the exercises, I am pretty much his running partner throughout this whole camp. I am a pretty good runner and being able to push him is a good asset to him. He feels that he needs to get his runs in aside from all of the other conditioning aspects that he is doing. So when he says he is ready to run I am ready to run. It’s easier when you go on a long run when you have somebody with you who is going through it to. The other day it was a rainy Monday and we were getting poured on – when doing it alone that five miles can easily turn into three, but when you have someone with you who is going step by step it’s easier to finish and get through that. In terms of nutrition and nutrients I’m big on colors and big on complex carbs and big on varying up the protein sources and varying degrees of amino acids to get into the blood stream and also the timing is really important – you’re utilizing certain nutrients. As soon as his workout is done he is sweating and getting something in his system right away – carbohydrates and hydration right back in. CHRIS ALGIERI: In terms of food there was no issue – what kinds of foods and what to eat and when. I would ask him what he wanted for dinner that night and he would say whatever you think. That made it very easy for me. Some of the things aside from the nutrition and his training – was getting rest – overtraining early. He was pushing very hard because it was a big opportunity. It’s easy to push each session and not rest enough and your mind is busy in between, so finding recovery time and really finding rest was something I was concerned about immediately when I first got here, then we were able to work that into the schedule. Things are more manageable now and there is a much better mood. Rest and recovery at the highest level is just as important as hard training. Danny is a big middleweight and it’s always been a struggle for him. Do you see it being different this time around? CHRIS ALGIERI: That’s really the idea to make it more comfortable. At this point a lot of the groundwork has been laid to make sure nutritionally he is very strong for fight week. He’s a big middleweight so on fight week it is going to be a hard cut. We want the cut to be hard but we want him to be big and strong on fight night and to be himself rather than be weight drained. We understand that going into fight week but that’s OK. We want him to be comfortable and feel positive, feel strong. The mental aspect of fight week is extremely important. If you have a big fight on Saturday night and you haven’t eaten a meal in three days and you’re in your sauna suit and you feel like a kitten and you’ve got a fight in a couple of days that isn’t really conducive to being at your best. I want him to be eating fight week, eating all week long, getting his workouts in, shedding the extra pounds and be ready to rock on fight night. How do you think making the weight easier will translate to fight night? CHRIS ALGIERI: I think it is going to help most with conditioning as we go throughout the rounds. He’s a big puncher so we want him to be snappy, to be able to move on his feet, to be able to react with his mind. That’s where nutrition really comes in. On the night before the fight what meal is Danny looking forward to? CHRIS ALGIERI: I haven’t spoken to him about that but I usually have pasta and meatballs. I don’t know what he likes but it’s going to be a meal where that includes carbohydrates and some protein in there and some good fats to make sure his blood sugar is leveled out. I have fighters that like to have Mexican food the night before, some like Italian, some like a big steak – it really depends on your preference but in terms of constitution of the meal I am going to look at it to make sure we have enough of each one. But in terms of what the food is, that really falls on him and we haven’t spoken about it and I don’t think he is thinking that far ahead yet. What is the nutritional breakdown of what you want him to have? CHRIS ALGIERI: We are going to look for some carbs and we are going to have some protein and we are going to have some fats to regulate blood sugar and sodium so he can retain water. There are so many meals that you can put together. CHRIS ALGIERI: During fight week I am going to be with Danny every day making sure that he is eating the right foods for his workouts. I will be at all of his workouts with him. I’m going to be cutting my weight as well so he has someone to kind of mirror and to understand that someone else is going through the pain as well. After the weigh-in and fight day make sure he has his nutrition and stay hydrated so he can be the best version of himself come fight night.